When you have a limited marketing budget, it’s tempting to dump 100% of it into strategies that put instant green in your bank account. And trust me, I’m all about that “notification high” of seeing real-time purchases filling up your inbox. That’s why TrustWorkz utilizes tools like FetchRev to retarget existing customers, build email lists, and make it easy for people to buy when their interest is high. But as a content marketer, I know that there’s so much more to digital marketing. Instant-purchase campaigns are the pizza to content marketing’s 5-star meal. Sure, pizza is delicious, curbs your hunger, and tastes twice as good delivered to your door when you’re watching Netflix in your pj’s, but if you manage your budget and research your options, dinner at a 5-star Michelin restaurant is going to be more satisfying in the long run (and involve some actual nutrients). Social proof is your Michelin-rating. What Is Social Proof and Why Does It Matter? Let’s start with the basics: what exactly is social proof? Psychologically speaking, it’s simple: we trust others more than we trust ourselves. Before those nightmarish preteen flashbacks kick in, hold up. Social proof isn’t about being accepted by the in-crowd. (Whew!) It’s about listening to others when you don’t have the info. Pre-internet, that meant asking your neighbors who did their landscaping. In today’s digital world, it’s a little more complicated — but only a little. Social proof is user-generated content (UGC) like comments, shares, and reviews that influence other customers. Basically, nothing beats word of mouth — even if it’s virtual! Did I say “boring”? I meant “mind-blowing.” That’s some serious buying power! How can your business take advantage of all that user-generated goodness? Social-proof is a low-cost way to build your brand’s reputation, which in turn builds sales. It doesn’t have the shiny ROI of instant-purchase tools like FetchRev, but if you do it right, you’ll develop a community of brand ambassadors who basically sell your brand for you. If you’re not doing these five things, you’re missing out on the power of social proof. 1. Don’t Just Request Reviews — Earn Them! 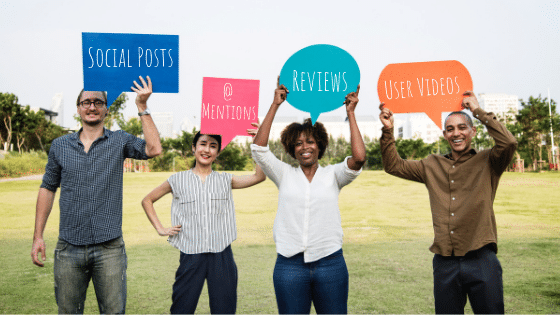 Customer reviews are the easiest way to build social proof for your business. But to get a great review, you have to earn it. Impress your customers every step of the way and they’re more likely to (a) leave a review, and (b) recommend you to others. Once you’ve wowed them with an all-star experience, make it easy for them to share by sending a follow-up email with a review link. Hollywood A-listers aren’t the only ones with influence anymore. Local social media influencers can actually do more for your business than a major celebrity endorsement. That’s because influencers have created their own micro-communities built on trust and relatability. If you want a simple way to get people talking, reach out to a local mommy blogger, trendsetter, or Instagram celeb and ask if they’re willing to give you a shoutout in exchange for a free product or service. Just remember, you’re asking for an honest review, so get ready to blow them away! People want to know you’re qualified. They also love businesses who are locally connected. If your business has won an award for local excellence, earned industry certifications, or developed community partnerships, list those logos on your home page, stat! 4. Extra, Extra, Read All About It! Did the local paper publish an article about your business? Were you featured on the local news? Did the college around the corner mention you as a great venue for a Greek Life event? If you’ve got it, flaunt it! Embed videos and link articles on your website to broadcast social proof that might otherwise get overlooked on customers’ ever-changing newsfeeds. User-generated content performs better than branded content, but that doesn’t mean you can’t DIY social proof. Feeling overwhelmed? Call in the reinforcements! Our social media and reputation management teams are experts in cultivating social proof to build community and credibility for your business. Give us a call to learn more about social proof for local businesses.